A generous helping of natural, organic peanut butter swirled into the batter gives these cake-style brownies a rich, nutty flavor that makes it the favorite of many. 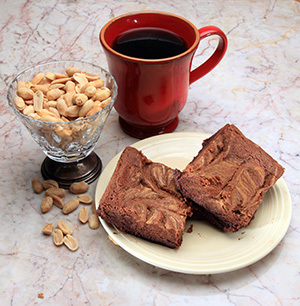 A generous helping of natural, organic peanut butter swirled into the batter gives these cake-style brownies a rich, nutty flavor that is the favorite of many. YOU CHOOSE THE DATE WE BAKE YOUR ORDER! All of our orders for Brownies, Cookies & Biscotti are baked to order and shipped fresh to you within hours of being baked on the date you choose. None of our "Freshly Baked" products are ever frozen or stored. However, we are closed on Sundays and cannot bake and ship on that day. Our policy of only baking to order insures that your order will arrive fresh with that better-than-homemade taste.